Dr Lesley Cheng from the Hill lab recently gave a TEDx talk on Dementia and her work developing a blood based test for Alzheimer’s Disease. 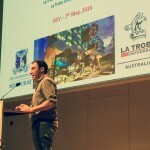 Ben Scicluna gives ‘Featured Abstract’ presentation at ISEV2016! Congrats to Ben Scicluna who was awarded one of three ‘Featured Abstract’ presentations at the ISEV 2016 Conference in Rotterdam!